Above: Only a few of the few voters attending last night supported the project brought by Recreation. The Recreation Co-Chair hopes the success of her following Article will result in more support of future projects at Annual Town Meeting. The last Article of the night, well past 10 at night, was a bylaw change to time future Annual Town Meetings to be more accessible for parents of young children. Article 5 moves the opening of Town Meetings to a Saturday afternoon in March rather than a weeknight. It was an issue that became important to Lavault after two of Recreation’s Articles were defeated in April. Afterwards, Lavault had lamented about the number of voters lost at the late hour and the number of people who told her they wished they could have been there. In keeping with her narrative, the sparsely populated room was dominated by older voters during her presentations last night. Luckily for those who wanted to be there but couldn’t, the majority of those attending supported a change that would welcome them in the future. Article 5 easily passed. Lavualt began her presentation of Article 5 by commenting that the failure of her prior Article was the reason she wanted the change. Article 4 to repair Kallander Field had just been soundly defeated. Judging by the number of voters who left before the Article 4 vote (and those who never came), she may be right. But counter claims over problems behind the drainage issues, with talk of silt-filled basins and erosion-caused trenches, muddy the issue. Even those who support Recreation could have ended up concerned that spending on the $248,300 project might end up wasted. And process issues raised questions about how voters want to manage Town expenses. Lavault lobbied for the need to maintain and improve “sub-optimal” and worsening playing fields owned by the Town. The project to repair Kallander Field was pitched as an important part of that effort. Working with Rec’s consultant and Public Works, the commission believed that the issues raised at last Town meeting were researched and addressed. 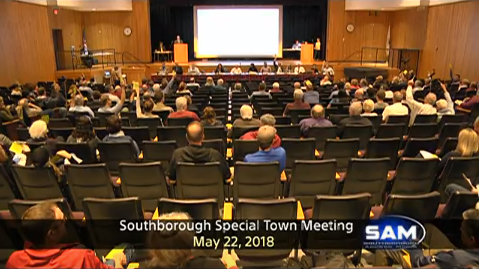 But, once again, project proponents were confronted on the floor by contradictory statements from opponents including Southborough Open Land Foundation. Lavault told voters that the basins at Carriage Hill were maintained and working and that silt wasn’t blocking operation. She explained that the DPW identified that the main issue on SOLF land was a trench that had been dug across their parcel abutting the field. SOLF representatives argued that a trench was never dug. Attilla Herczeg explained that erosion that happened as water overfilled the basins for the last 10 years led to their “little, mini grand canyon”. Claims that the catch basins had been properly maintained by Carriage Hill were also questioned. SOLF reps acknowledged that the owners association had been continuing to clean out the basins annually. But SOLF President Whitney Beals questioned if the job was done properly. Noting that the landscapers had asked for drawings of the original system so they could understand how deep basins go, he wondered if they knew enough about the system to correctly maintain it. Advisory Member Doriann Jasinski read from a 2010 letter from a former Town Engineer that informed Town Officials that the catch basin had failed and the failure was causing erosion problems on SOLF land and Kallander Field. Barry Rubenstein, a resident of Carriage Hill’s association took umbrage at statements made at Annual Town Meeting. At that time, Beals had claimed that CH had stopped maintaining the basins some years back. Rubenstein said the association spends $3,000-5,000 per year maintaining the basins and sends the information to SOLF annually. There was some discrepancy over his claim that they weren’t legally obligated to but had voted to do it in support of the community. Upon questioning, Town Counsel Aldo Cipriano rebutted that CH is legally required to maintain the basins. Lavault reinforced that the first stage of the project was to study the drainage issue. If they found their repairs couldn’t fix the problem within the budget, the project and spending would stop. But Meme Luttrell argued that it would make more sense to ask for funding to study the drainage than to raise our taxes with the bigger ask only to find that it wasn’t a viable project. Before residents debated the project merits, Town officials opposed the project based on principal. Selectwomen Bonnie Phaneuf and Lisa Braccio each argued about the impact of a Town board bypassing selectmen to ask voters directly for the funding through Citizen Petitions. Phaneuf focused on the amount of money that voters already have pledged to Town Recreation projects, plus the projects’ financial issues and delays caused by over reliance on Public Works staff. Braccio focused on the precedent an approval would set and the potential for future departments to follow suit. She worried about the impact on the Town’s financial health. While the project had been narrowly defeated in April, last night the majority voted against it. Many thanks to Mrs. Phaneuf for finally organizing detailed information and disclosing the total dollars spent (approx. $2.5m) on recreation projects in the past few years, while other projects and needs go underfunded. Finally, some coherent information and much needed, objective leadership, standing up to the ridiculous re-packaging of Kallander Field, a project just voted down by the taxpayers at Town Meeting in April. Here is the danger of having amateur citizen volunteers “in charge” of committees, as demonstrated last night: this volunteer had the unrelenting gall to re-package this huge funding request, outside of the normal budget process under the guise of “new” information surfacing. What was the “new” information? YOUR tax dollars were used to pay a LANDSCAPE ARCHITECT (you read correctly) — NOT an engineer to opine on the conditions of a (get this?!) detention basin (??!!) being used as a playing field. Yes, the requester was asking for another $248,300, i.e. to flush your tax dollars down the hill, along with the water, as finally illuminated by Mr. Anderson. Thank God that Mr. Anderson had the good natured altruism and common sense to step forward to explain the history and structural nature of the site. THIS IS A DETENTION BASIN !! How does a situation like this even evolve to this point? I am not sure that the situation gets any more moronic than this. The taxpayers were subjected to yet another completely excessive, long, long diatribe, hounding for money. (I would have paid money to stop the presentation.) This snowball of dangerous amateurism spewing misinformation and needless spending requests was resoundingly rejected by the taxpayers. The citizenry was having none of it. After much wasted time, and an overly indulgent Moderator (what does that tell you? — after a night of hearing one-sided arguments? ), virtually NO ONE voted for this article. What was the upshot? The voters were subjected, yet again, to another outright nonsensical request and a huge waste of time. These amateurs may be well meaning, but this has got to stop: the proof is in the pudding. What a ridiculous waste of the public’s time and resources. The question remains: how on earth was this landscape architect look-see AUTHORIZED?? Your tax dollar expenditure AUTHORIZED BY WHOM?? Also, reportedly DPW jumps in and absolves the private landowner of issues related to drainage system, opening a Pandora’s box of legal issues? Why on earth would the Town (DPW) trespass on SOLF land and absolve the owners of the abutting Carriage Hill land?? In the spirit of adhering to Open Meeting Law, these matters need to be cohesively discussed, consensus gained, and authorized by the appropriate boards and other parties under the appropriate and watchful gaze of the taxpayers. To Mrs. Phaneuf, thanks again — please see to it that appointees to all boards and committees are the best possible candidates with appropriate skill sets and remove those who mean well, but cause more harm than good. Thank you to Mrs. Bracchio and Mrs. Luttrell as well for their excellent presentations. The town appreciates the hard work and informed, careful presentations. I don’t mind you anonymously voicing strong or dissenting opinions. I allow anonymous comments so people can feel free to share opinions that dissent from those of the general community or friends/neighbors/co-workers. Responding to your comment about the “volunteer” – Whether I agree or disagree with any choices the Recreation Commission has made, I applaud their volunteerism, the sentiment behind it, and their efforts on behalf of their community. Otherwise, I wonder what you’re preferred method of governing the Recreation process would be. But – bottom line – I don’t have any objection to you questioning the decisions or process. Anyone serving on a public board or in Town government should expect to be called out when people think they have made a bad decision, etc. It comes with the job. But it would be nice if people made an effort to be respectful when doing it. One more point. It turns out that we were both wrong. Pare Corporation, which was involved with the study, is an engineering firm. Thank you for pointing out the unnecessary meanness in so many of the anonymous comments, Beth. I wish people would be more kind. It is fine to disagree and have a healthy debate, but there is no need to be cruel. Sorry, YOU ARE WRONG. It was a landscape architect, NOT an engineer: Mr. Arthur Eddy of Traverse Landscape Architects. He did the Recreation Master Plan and the presentation at Special Town Meeting. Also, this is not about having a “kumbaya” moment. This is business, logic and reason, accountability and taxpayer dollars going to waste. Please stop letting people post pseudonymously. If they don’t have the courage to face the world with their names attached, let them keep it to themselves. Allowing pseudonyms protects the worst impulses. It’s very frustrating to those of us who are accountable with our names for our facts and our opinions, when someone with only a handle can assert anything he wants, true, false, or indeterminate. Looking at American history, I’m thinking that Alexander Hamilton, John Jay, James Madison and Benjamin Franklin would completely disagree with you (not to mention Thomas Jefferson). I say this from the fact that they all wrote anonymously many times during their carriers. All of the Federalist Papers were written under a pseudonym. That sounds like pretty good company to me. Yeah, they were in danger of execution for treason, which was pretty different from social pressure in our small town. Good thing none of them signed the Declaration of Independence then. Well said. We’ve chosen to live in a town that relies on volunteers – amateur volunteers – to serve on a variety of committees. Further, open Town Meeting is by design, an amateur legislature. I didn’t agree with all of the votes on Tuesday night, nor all of the positions that were presented. However, I respect that people volunteer their personal time to give back to the Town. That includes our elected and appointed members of our town government. I wish there was a “LOVE” button for this comment. I agree both with the writer in Doreen. I’m trying to figure out who authorized 3 to 4 cuttings of mooney field a week and the literal turbine blowing of grass bits that breaks the sound barrier in our neighborhood. I’m up to seven emails between Rec and the DPW trying to find this out so I can address it and what recourse we have so I understand the frustration of the writer and I understand Doreen‘s point to civility. Southboro cannot even field more than one team per age level we had 3 to 4 when my kids were growing up. I don’t think we need any more fields or resurfacing I think were very good for now and the town people made the right decision talked about in this article. Hello, This might come off as a silly question, some would even go further to say obvious questions but either way i will ask the question. Why are Taxes in Southborough so high!? I have been scratching my head at this since i moved here. It def not because we are using the money to pay for Kindergarten, (we pay for that), or pave our roads, (the state is doing that), or sewer (we all have septic systems). Maybe its because we have trash pickup? Nope, how about street cleaning? Nope, Free recycling? Nope that’s $200. Maybe its the amazing downtown we have that’s expensive to maintain, NOPE! don’t have that. So why I ask? The education in town is great no doubt but calm on, that cant be the only reason our taxes are high. 62% – Education, 34% Government and 2% other (debt, etc.). Some will argue that we could lower the residential tax rate by moving to a split rate, and increase the commercial rate. Others will say that penalizes businesses, and makes the town less attractive to companies. The proposal has come up at Town Meeting before, and will probably be brought up again. Sorry, YOU ARE WRONG about who did the Recreation Master Plan and the presentation at Special Town Meeting. It was a landscape architect, NOT an engineer. This is all about business, logic and reason, accountability and taxpayer dollars going to waste. With the exception of a few, including Ms. Phaneuf and Ms. Bracchio, the inability to keep the focus on business is staggering. The main point is this: Are these people wasting taxpayer dollars needlessly through their apparent incompetence? Thank God the taxpayers virtually unanimously rejected this most recent run-around attempt to bypass the annual budget process. They have shown time and time again (see the rec summary slides in the Phaneuf presentation) that they consistently underestimate the costs involved for various projects and then mismanage those projects (case in point: the lights that don’t plug in – and the public learns about it from a resident driving by who sees a generator and first learns of it in this blog). More importantly, they are inappropriately and unjustifiably taking up valuable taxpayer time at town meeting due to their outright unabashed brazenness in attempting to skirt the budget process. and the 2.19.16 Minute Mark. If it weren’t for the good-natured, altruistic input of Mr. Howard Anderson, we would still be sitting and listening to this skirt-the-budge pitch. He was doing all a favor by explaining that the field is not a field at all, but a retention basin. In simplest terms and so all can understand the facts: This is a basin being used as a field. 2) Another important, SALIENT POINT TAKEAWAY: IT IS A DETENTION (NOT RETENTION) BASIN. This is not constructed as a playing field. IT IS A DETENTION BASIN, which the purpose of construction is to hold water. As Mr. Anderson correctly points out: any “fixes” will likely be washed away, along with the tax dollars spent. Painting this emotionally as a “kindness” or “love” issue is inappropriate and a complete disservice to the town. As they say in movie “As Good As It Gets” (and I hope it isn’t), sell crazy somewhere else. . .this is about taxpayer dollars, reason, and accountability. I was not referring to the presentation made at STM. I’m referring to the creation of the original report and the assessment done by DPW in between meetings – as reported to me by the Recreation Commission. And if you look at the report, it was done through Pare Corporation – an engineering and planning firm. Understood. However, the Master Plan (?!) was done by the landscape architect. The landscape architect was the “voice” of the presentation at Special Town Meeting and was presenting on behalf of their Article 4. The main point is this, as aptly pointed out by Mr. Anderson: DETENTION BASINS are constructed to hold water — their purpose of construction is to detain water. The area isn’t a playing field. It is a basin being used as a field. The basin is subject to the 100 year flood plain, which means as Mr. Anderson correctly stated, it will likely be under water at some point and improvements and money get washed away. Engineer or landscape architect, who is authorizing these kind of crazy expenditures in light of the fact that this is a detention basin? Why is Recreation pointing you to Pare? Pare isn’t the issue. The issue is that this is a DETENTION BASIN. Any vendor will gladly take taxpayer money for a study if we ask them to. This is a matter for the taxpayers (and thank goodness this ARTICLE FAILED OVERWHELMINGLY) using common sense and logic — these entities are not the boss. The taxpayer is. Saturday Town Meetings are a radical change. It’ll be interesting to see what changes happen because of them. Sadly I don’t think it will improve attendance.